NASHVILLE -- Fifteen years after its launch, the Renault-Nissan Alliance is targeting the United States in earnest. Renault-Nissan CEO Carlos Ghosn, whose alliance faces bigger competitors that can use larger volumes to wring lower prices from suppliers, wants to maximize efficiency. He is pushing his companies into common product architectures, manufacturing and r&d. By 2018, 70 percent of Renault and Nissan models will be built under the alliance's new "common module families" approach to auto design, which is expected to cut purchasing costs by nearly a third. The Rogue crossover, introduced late last year, comes from the common module approach, in which Nissan and Renault work from shared parts bins. In addition to building the Rogue in Tennessee, Nissan has picked a Renault factory in South Korea to begin producing thousands of Rogues per month to ship to West Coast dealers in the United States. Next year U.S. Infiniti dealers will get the Q30 compact hatchback, which is imported from England. That vehicle is developed on a Mercedes-Benz architecture -- the result of a program being shared with Nissan through the Renault-Nissan collaboration with Mercedes parent Daimler. This year Infiniti will get a new Mercedes-designed 2.0-liter four-cylinder engine built at Nissan's U.S. engine plant in Decherd, Tennessee. The engine sharing deal also came about through Renault-Nissan-Daimler collaboration. Nissan has acknowledged the possibility of producing an additional vehicle at its new plant in Aguascalientes, Mexico, that would be shared by Infiniti and Mercedes-Benz dealers in the United States. Renault-Nissan Alliance output is expected to continue rising this year. This year Nissan's engine factory in Decherd, Tenn., will begin producing a four-cylinder engine designed by Mercedes that resulted from a joint effort by Renault, Nissan and Daimler. Renault-Nissan global light-vehicle output has risen with that of many rivals. 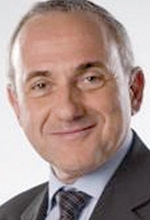 Christian Mardrus, newly promoted to executive vice president for the alliance, says the product arrangements with Daimler would have been impossible without the alliance structure between Nissan and Renault. The coming products will represent a new level of alliance activity, Mardrus says. "We are now delivering the synergies of the alliance," he says, acknowledging that they have been years in the making. "And we want to go further. The idea is to boost and accelerate both companies to fight against the competition. We can see that the most competitive companies in our industry are the biggest." In March 1999, Nissan of Japan and France's Renault united in a loose alliance of shared resources, technical expertise and cross-ownership, headed by Ghosn. But since then the partnership has been nearly invisible in Nissan's critical North American market. The benefits have shown up elsewhere, helping the automakers in distant world markets, including Russia, bolster the bottom line and improve back-office operations. Now Ghosn wants more -- including more shared manufacturing. Larger global competitors such as Toyota and Volkswagen have an advantage of scale. Volkswagen Group sold more than 9.7 million vehicles worldwide in 2013. VW, Toyota and General Motors are all on track to sell 10 million units a year. The Renault-Nissan Alliance last year produced 7.4 million vehicles. Nissan believes that if the alliance can share more parts, manufacturing and development, it will reap better economies of scale. Mark Wakefield, managing director of AlixPartners and leader of its automotive practice for the Americas in Detroit, says increasing economies of scale is a new Holy Grail for global automakers. "If an OEM moves a modular platform's volume from 750,000 to 1.5 million units, we would expect a $500 per vehicle benefit," he says. There also would be a potential 15 percent savings on the cost of developing derivative models, Wakefield says. 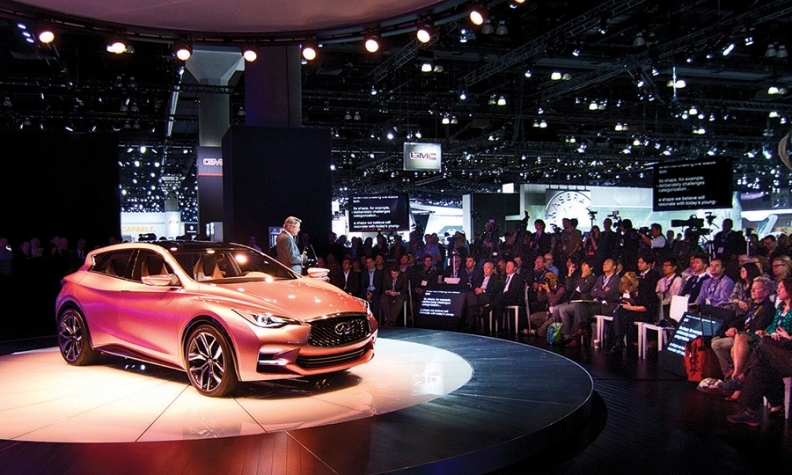 Infiniti North America's Michael Bartsh introduces the Q40 compact hatchback at the Los Angeles Auto Show in November. The Q30, scheduled to go on sale in the United States next year, will be built on Mercedes-Benz architecture -- the result of Nissan-Renault's collaboration with Mercedes parent Daimler AG. In February, analysts at Morgan Stanley in New York pronounced Volkswagen and Hyundai-Kia the global automotive leaders in cost competitiveness. The trading house concluded that Renault-Nissan's competitiveness is "bringing up the rear, with no obvious competitive advantage in platform strategy." Clearly troubled by the gap, Ghosn wants more concrete benefits from the alliance. For instance, he wants Nissan to achieve an 8 percent global market share and 8 percent operating-profit margin by March 2017. Nissan currently holds a 6 percent global market share. For the nine months ended Dec. 31, 2013, it posted an operating-profit margin of 4.1 percent, down from 4.5 percent a year earlier. In November, Ghosn reorganized his top executive ranks to get things moving faster. In March, he altered the alliance's organization to speed results in four specific areas: r&d, manufacturing, purchasing and human resources. Better economies of scale will also help Nissan to deliver a series of expensive new technologies, says Andy Palmer, Nissan's global planning chief. Among them: an effort to take the industry lead in self-driving vehicles, and a mission to claim luxury sales from German premium brands. The alliance's expanding product arrangement with Daimler will make that happen faster, Palmer says. "You need to be able to compete with them," Palmer says of the German luxury producers. "If you look now, we have the right engines, thanks to the expert collaboration with Daimler." Nissan's North American operations have enjoyed fringe benefits from the alliance. There were immediate financial gains from the 1999 linkup. The alliance saved Nissan from bankruptcy and Nissan is today a vastly stronger automaker in the United States than it was in the late 1990s. Another visible change: Combining Nissan and Renault parts purchasing created U.S. supplier opportunities. Renault's involvement in Nissan led to a large-scale dismantling of Nissan's traditional Japanese supplier relationships in North America. U.S. parts companies have made their way deeper into Nissan's North American manufacturing plans. French and other Renault-friendly European suppliers have gained Nissan business in the United States and Mexico. Nissan also needs larger volumes for individual model platforms. Increasing individual model sales in the United States is ideal -- but is unlikely to add hundreds of thousands of annual production units to the volume of a Sentra or a Maxima. Larger scale would come from building next-generation global Nissan models from shared parts and modules with Renault. 1. Not every U.S. Nissan model lends itself to architectural sharing with Renault. 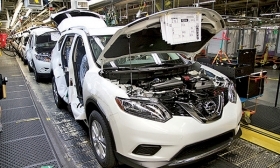 The 2015 Murano mid-sized crossover, for example, which will be built starting this year in Canton, Mississippi, will not use the common module architecture. And the French automaker has no equivalent of the full-sized Titan pickup, which Nissan is trying to make more competitive with a redesign of the 2015 model. 2. Nissan will have to keep a watchful eye to make sure there is no brand bleed between Nissan and Renault, or between Infiniti and Mercedes as architectures draw closer together. Shiro Nakamura, Nissan's chief creative officer, travels regularly to Renault's design studios in Paris to look over designs. But he is hardly seeking ideas. "We have to make sure our designs are not getting too close," he says. If he sees a Renault vehicle styling that bears a resemblance to a Nissan vehicle, he alerts Renault's design leadership. Renault also watches Nissan's styling work to make sure Nissan keeps its distance from Renault. Maintaining brand identity will be one more challenge in drawing Renault and Nissan closer together, Nakamura says: "We don't want to design the same car. But at the same time, we want to maximize synergy."